Learn how to make an Easter cupcakes recipe in many sizes, flavors, shapes and forms. They can be decorated to fit any occasion or served plain. One fact is clear, people love cupcakes. This is why cupcake stores have popped up all over the country and even a TV program about cupcakes. Just think about that! In my younger days, I could never have imagined this happening! As I said, cupcakes can be made in many sizes. The mini size is great for a child or someone who simply needs a bite of something sweet. The regular size, using ¼ cup of batter, to me is the “perfect” cupcake. Of course, for those who really love this delicacy, a “jumbo” using ½ cup of batter would be the perfect size. There are also a variety of molds on the market to use when you are learning how to make an Easter cupcakes recipe. I am using an egg mold to make eggs and bunnies for Easter. This also takes ¼ cup of batter; the same as a regular cupcake. 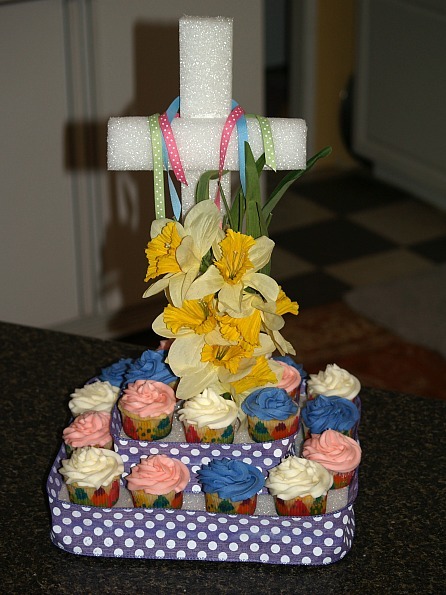 I am going to make an Easter table centerpiece that you can use when you learn how to make an Easter cupcakes recipe. I have a leftover piece of Styrofoam. From it I am cutting: ONE 12 X 12 INCH PIECE; ONE 7 X 7 INCH PIECE; ONE 2 X 21 INCHES for cross base; ONE 2 X 8 INCHES for the cross T; EIGHT 2 X 2 INCHES for the legs. To assemble the holder for your Easter cupcakes recipe cut holes in the centers of the 12 X 12 piece and the 7 X 7 piece so the cross base fits down through the holes. Using a STYROFOAM GLUE, glue 4 legs on each of the square pieces and let dry; glue the cross “T” across the base. After drying, turn the square pieces over placing the large one on the bottom and the smaller one on top. Gently push the cross down through the squares. The cross should stand up and hold the two layers in place. Decorate as you like and place the cupcakes around the squares. Everyone wants to know how to make lemon cupcakes. This seems to be a favorite for Easter cupcakes recipes. These are light and have a wonderful lemon flavor. It is a large recipe and will make about 38 regular size cupcakes. The lemon frosting is also delicious! Preheat oven to 350F degrees; line cupcake pan with paper liners. Cream butter and sugar in mixing bowl; beat in eggs one at a time. Add lemon peel and vanilla; mix well. 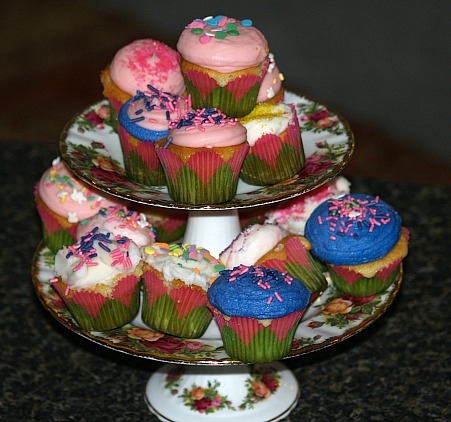 Fill cupcake liners with ¼ cup of batter; bake 25 to 30 minutes or until pick comes out clean. Cool completely on wire rack; mix lemon frosting. Frosting; Cream butter and sugar in mixing bowl; add lemon juice, lemon peel and milk. Beat mixture until smooth and frost cupcakes. 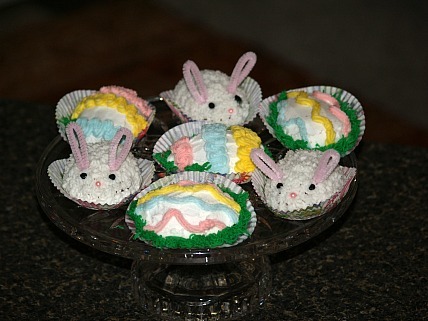 This makes a very easy Easter cupcakes recipe using prepackaged mixes. They can also be very easy to decorate for Easter using packaged candies. Spoon about 3 tablespoons of batter into each ice cream cone filling each about ¾ full. Place cones in a 9 X 13 inch baking pan; bake 20 to 25 minutes or until tops spring back when touched. When frosted with your favorite icing, this Easter cupcakes recipe will be a hit on your Easter table. Cream butter, peanut butter and brown sugar in mixing bowl; beat in eggs and vanilla. Combine dry ingredients; add to creamed mixture alternately with the milk. Fill each cone about ¾ full; place cones in baking pan and bake 25 to 30 minutes until pick is clean. Frost and decorate after cooling. Combine filling ingredients except chocolate chips; beat until smooth and add chocolate chips. Sift together all dry ingredients; add all liquids to the sifted ingredients and blend until smooth. Fill paper lined cupcake pans 2/3 full and drop in a heaping teaspoonful of filling. Bake for 25 minutes; makes 26 cupcakes. Preheat oven to 400F degrees; line cupcake pan with paper liners. Place all ingredients except marshmallow cream and chocolate kisses in blender container. Cover and blend on high speed stopping occasionally to scrape sides of container; blend only to moisten. Fill muffin cups 2/3 full; bake 20 to 25 minutes or until pick comes out clean. Immediately spoon ½ teaspoon marshmallow cream onto center of each cupcake; top with Kiss. Bake 3 to 5 minutes longer until marshmallow cream is light brown.